Yikes…bad day to be a Decepticon..
1. ) Leo Prime is technically not “Optimus Prime” by any stretch, however, I feel Hasbro redecoed him for people like me, who want nothing to do with Beast Wars, but love the look of an OP colored Lion Transformer. He even has an Autobot badge on his forehead instead of a Maximal one. 2.) G1 Optimus re-issue’s Roller, Fists, and Gun are all sealed in the box, and I didn’t want to open them up seems he’s right back in his box now, and even though the box is beat up, I’d rather keep him in there. 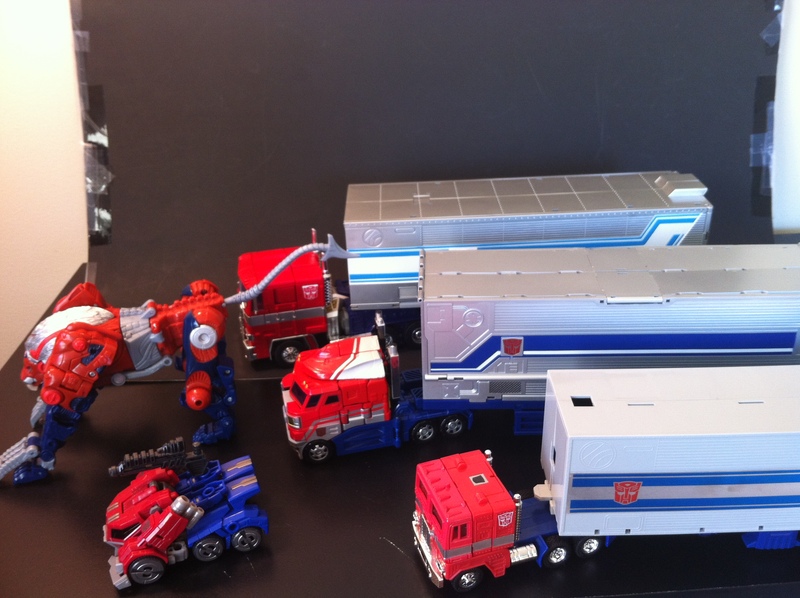 Both MP and Classics Prime and their trailers are Reprolabeled. You can’t quite see them from this angle, but they’re both great sets! 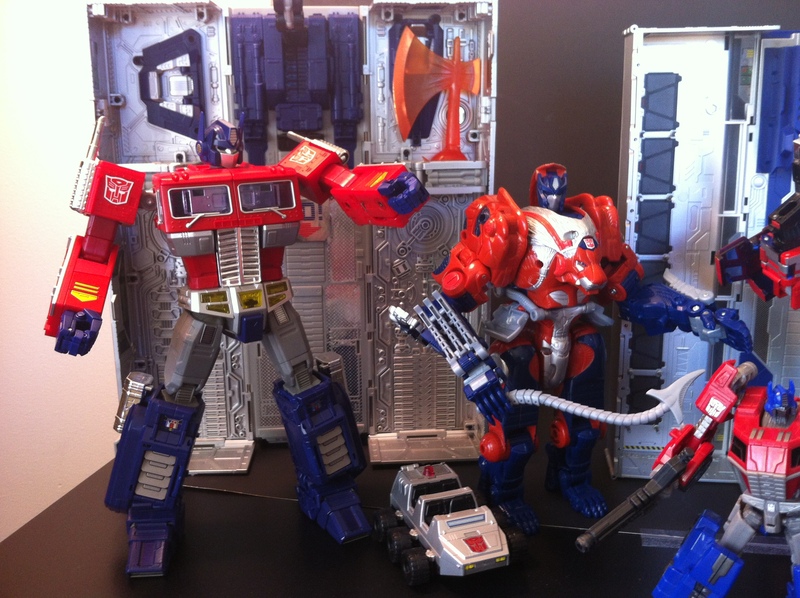 I’ve also ordered the new Fall of Cybertron set for FOC Prime, they add some very nice details. 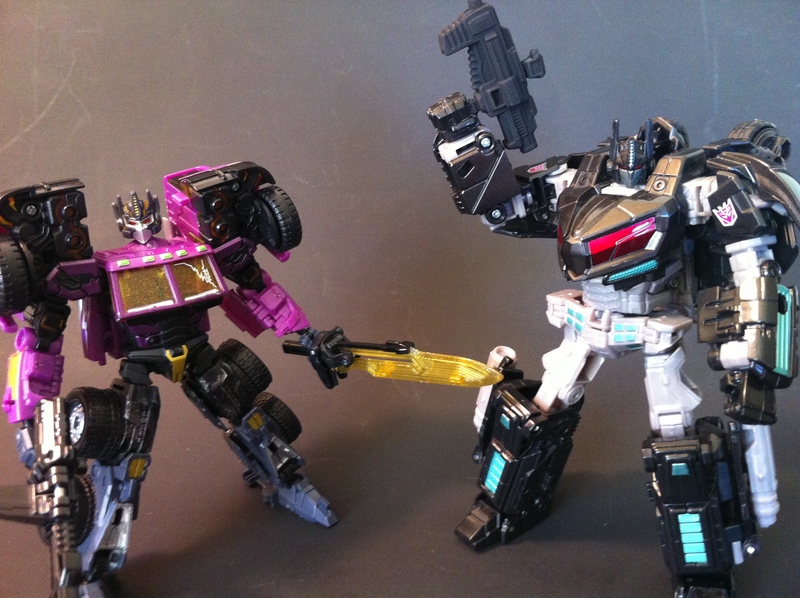 Shattered Glass Prime (Ver.2) and WFC Nemesis Prime from the Tokyo Toy Show 2011 set. I switched WFC Nem. Prime’s gun to give to Shattered Glass Prime, and picked up a Shapeways Neuron Assault Rifle seems it’s an in-game accurate weapon (aside from not being part of his arm). Not perfect, but It looks WAY better to me, and I’m sure as shoot not spending 200 bucks on his Henkei version. Lol, and my second least! Movie Prime is my least favorite for sure. Is this all from that one haul you posted about a week or so ago? Dude! That’s killer. 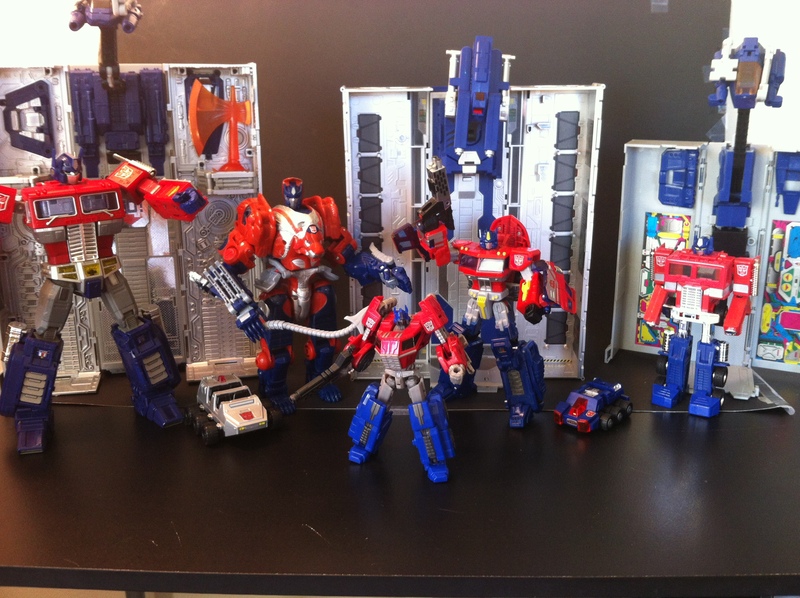 Not all, no, I had MP Optimus and FOC Optimus, Leo, Classics and G1 were in that haul. Pretty awesome though! 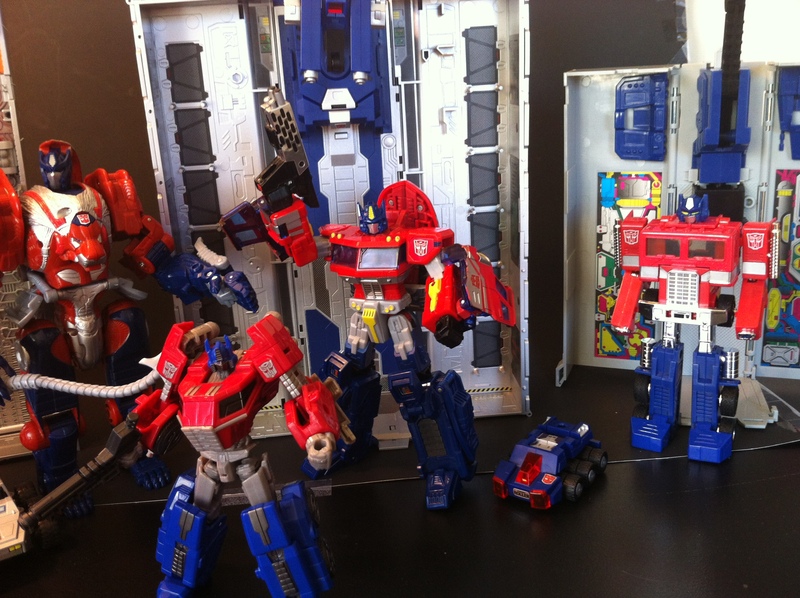 i don’t own either but i like the wfc optimus design mor than the foc version. 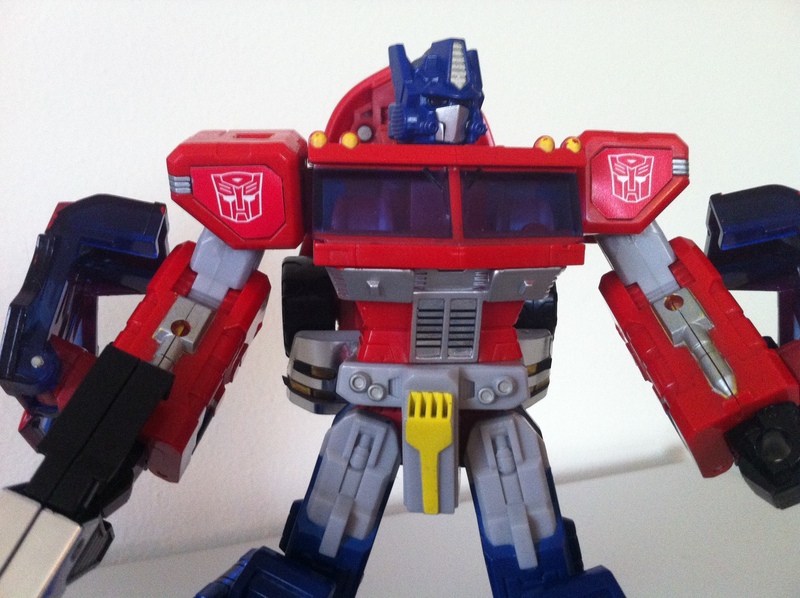 the foc is just too boxy and i don’t like boxy bots as much as well rounded bots, except g1 because they were all boxy. FoC Optimus has very few admirers. I’m one of them, but we’re a small number indeed. 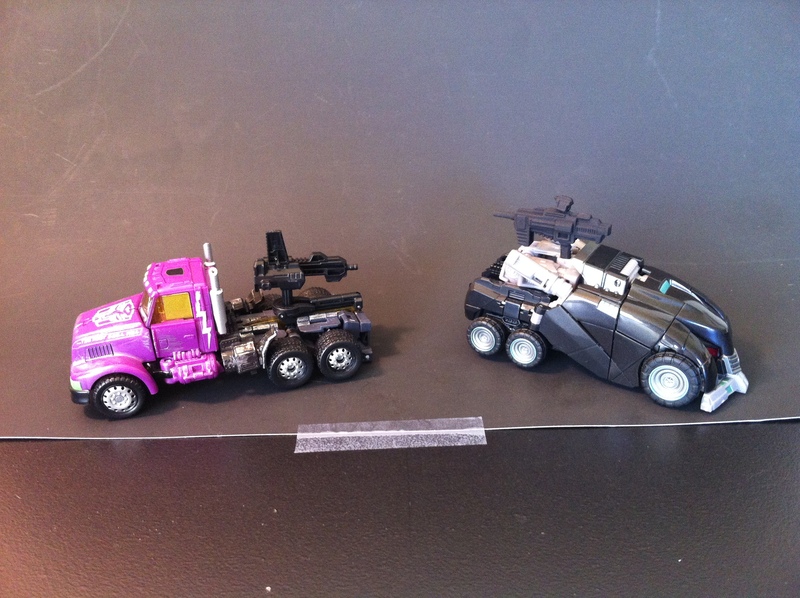 He does need a trailer, I think that would help his vehicle mode a lot.